Enjoy One FREE mid-week night when you stay 2 more! Bring the family to Harbor Springs for your Spring Break. Enjoy the fitness center with the indoor pool and hot tub, exercise equipment and sauna. Special offers at Nubs Nob Ski Resort too! Buy your full day lift tickets using Canadian currency and they will accept your cash at par! 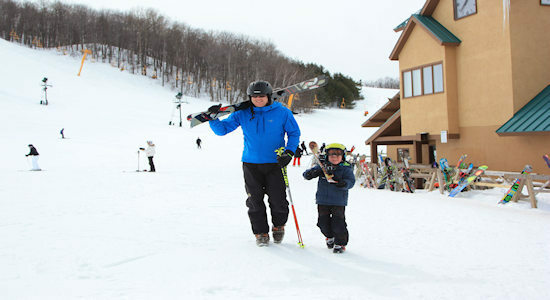 Kids 9-12 ski for only $10 on non-holiday weekdays when accompanied by a skiing parent. Kids 8 and under ski FREE when accompanied by a skiing adult. For more info visit Nubs Nob. Please call us for this special at 800-748-0245.